The creator of the first modern abstract paintings, Wassily Kandinsky was an influential Russian painter and art theorist. In his youth, he studied law and economics at the University of Moscow, and was later hired as a professor of Roman law at the University of Dorpat in Estonia. He was 30 years old when he began his studies in painting, focusing on life drawing, sketching, and anatomy, at the University of Munich. He was not immediately accepted into the school as an art student, and so in the meantime he began learning art by himself, gaining artistic insight from Monet’s Haystacks and Richard Wagner’s composition Lohengrin. He was also influenced by the teachings of anthroposophy, as such, his abstract works were a creation of his intense philosophical beliefs, based on his own personal experiences with art. The devotion to inner beauty remained a central theme in his art. In 1914, after the beginning of World War I, Kandinsky returned to Moscow, where he did not find much inspiration in the art world. In 1921, he returned to Munich, where he taught at the Bauhaus school of architecture, until it was closed by the Nazis in 1933. He was an active art theorist, publishing a number of books on art theory, and developing a complex and deeply emotional theory about the ability of colors and shapes to represent sound and evince human emotion. He eventually traveled to the United States to lecture on the topic. After the Bauhaus was closed, Kandinsky moved to Paris, where he was mostly isolated from the other Impressionist or Cubist painters. He later became a French citizen, and lived the rest of his days there. His legacy lives on in the newly created Kandinsky Award, which rewards a promising young Russian artist a 55,000 euro prize, and attempts to elevate the status of contemporary Russian art. Wassily Wassilyevich Kandinsky (Russian: Васи́лий Васи́льевич Канди́нский, tr. 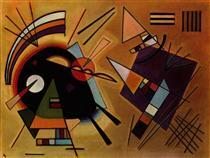 Vasily Vasilyevich Kandinsky) (16 December [O.S. 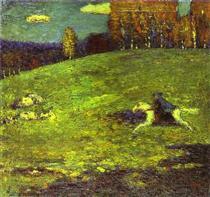 4 December] 1866 – 13 December 1944) was a Russian painter and art theorist. He is credited with painting one of the first recognised purely abstract works. 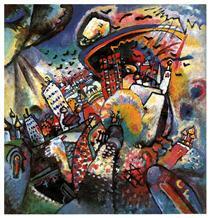 Born in Moscow, Kandinsky spent his childhood in Odessa, where he graduated at Grekov Odessa Art school. He enrolled at the University of Moscow, studying law and economics. Successful in his profession—he was offered a professorship (chair of Roman Law) at the University of Dorpat—Kandinsky began painting studies (life-drawing, sketching and anatomy) at the age of 30. 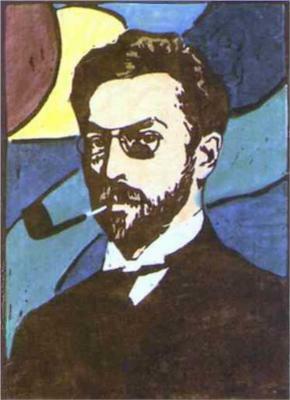 In 1896, Kandinsky settled in Munich, studying first at Anton Ažbe's private school and then at the Academy of Fine Arts. He returned to Moscow in 1914, after the outbreak of World War I. Following the Russian Revolution, Kandinsky "became an insider in the cultural administration of Anatoly Lunacharsky" and helped establish the Museum of the Culture of Painting. However, by then "his spiritual outlook... was foreign to the argumentative materialism of Soviet society", and opportunities beckoned in Germany, to which he returned in 1920. There, he taught at the Bauhaus school of art and architecture from 1922 until the Nazis closed it in 1933. He then moved to France, where he lived for the rest of his life, becoming a French citizen in 1939 and producing some of his most prominent art. He died in Neuilly-sur-Seine in 1944. Kandinsky was born in Moscow, the son of Lidia Ticheeva and Vasily Silvestrovich Kandinsky, a tea merchant. His family comprised German aristocrats, and from his maternal side he also had Tatar origins, to which he ascribed the "slight Mongolian trait in his features". Kandinsky learned from a variety of sources while in Moscow. He studied many fields while in school, including law and economics. 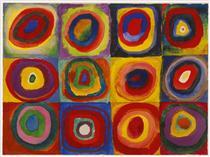 Later in life, he would recall being fascinated and stimulated by colour as a child. His fascination with colour symbolism and psychology continued as he grew. In 1889, he was part of an ethnographic research group which travelled to the Vologda region north of Moscow. In Looks on the Past, he relates that the houses and churches were decorated with such shimmering colours that upon entering them, he felt that he was moving into a painting. This experience, and his study of the region's folk art (particularly the use of bright colours on a dark background), was reflected in much of his early work. A few years later he first likened painting to composing music in the manner for which he would become noted, writing, "Colour is the keyboard, the eyes are the hammers, the soul is the piano with many strings. The artist is the hand which plays, touching one key or another, to cause vibrations in the soul". 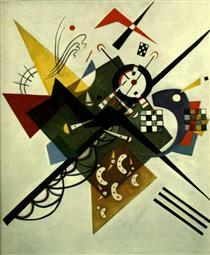 Kandinsky was also the uncle of Russian-French philosopher Alexandre Kojève (1902-1968).